We're prepared for your pet's needs when seconds count. Our BluePearl veterinary emergency vets can help you get through those scary moments when your pet is suddenly injured or ill, or when your family veterinarian is unavailable. Our highly qualified doctors and veterinary nurses can evaluate and stabilize your pet quickly and compassionately. In-house diagnostics and state-of-the-art intensive care units allow us to provide pets with the full care they need to heal. Many of our hospitals are open 24/7, every day of the year, including holidays. 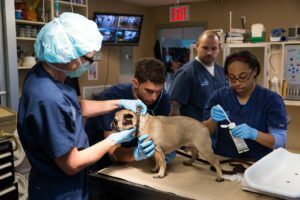 Additionally, many of our veterinary emergency hospitals also provide specialty veterinary services, such as internal medicine or oncology, so the emergency doctor can work closely with other teams to provide appropriate care in the crisis and seamless follow-up. Our doctors also work closely with your family veterinarian. Our goal is always for your pet to have the best chance at a complete recovery.